I know this is somewhat premature, but we are definitely going to use cloth nappies for our bub so I've been sewing some in anticipation! A newborn needs at least 2 dozen nappies, so I figure if I start now then I'll have plenty of time to get all the newborn and infant sizes done. 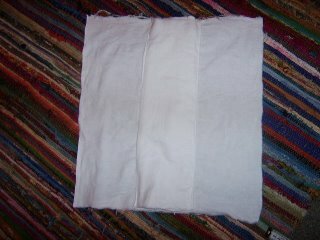 I'm going to be making covers and pocket nappies too, but I've started with prefolds. 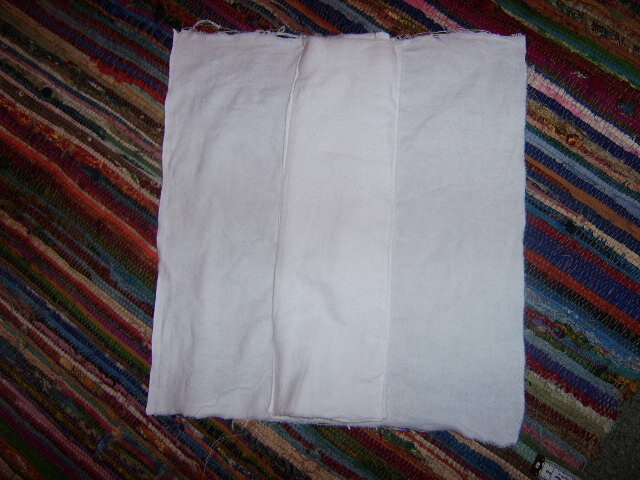 This means that the nappy is sewed in a square with many layers of padding down the centre for extra absorbancy. Remember how when we were young all those nappies were white towelling? Well that's so 70's man - things are way cooler now. I bought several metres of 100% flannel in groovy colours from Spotlight for $2 a metre on sale, and five colours of microfleece (for wraps and pocket nappies and liners) for $60 in total. This should be enough to keep our baby in not only functional but also incredibly cool and groovy nappies for a year. Considering it would normally cost $100's - if not $1000's - for disposables for that time frame, plus the environmental impact this is a bargain people! This is the inside of the nappy. The centre panel is 6 layers of flannel which is stitched onto a single layer of flannel before putting on the coloured flannel outside layers. My overlocker isn't working, so I sewed the whole lot inside out, turned it and top stitched with some fancy zig zag. When my overlocker is fixed I'll be able to just sandwich the layers and go around the outside which should take about 1/4 of the time. Although it didn't take me long - I made 4 entire nappies within 2 hours tonight and it was my first time. These are the four finished nappies. So groovy! These are newborn size and are teensy tiny. They have to be washed with detergent about 5 times in hot water before use to make them properly absorbant. I'm going to wait until I finish them all and do them all at once to save water. This is teddy modelling the finished result. I didn't have any nappy pins so I just used dressmaking pins to hold it on! Once baby has outgrown these I can use them as stuffing in pocket nappies, which are my next project. 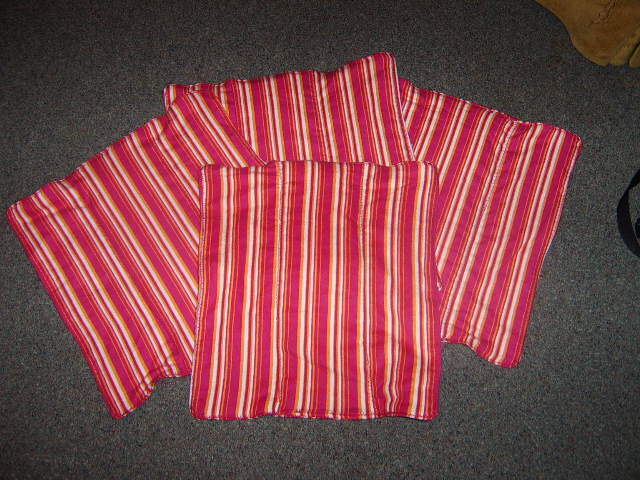 These are made of polar fleece in two layers, and inbetween the layers you stuff them with absorbant material. They have velcro or snap closures and elasticised legs, so they look like the disposables do in terms of "easy to apply" but great for babies skin and the environment. Here are some links about making cloth nappies and where they can be bought by WAHM's (work at home mums). Bubba Earth is an Australian site that sells patterns and materials for making nappies. Bits For Bots is run by a Queensland mum who makes all different kinds of nappies for sale. 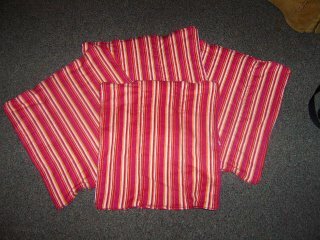 If you look at the fleece pocket nappies, they're what I'm going to make once I finish the prefolds. But with applique on the bum! The Diaper Hyena is a great resource for using cloth nappies. Lots of links to free patterns and tutorials and good pictures showing how to use all the different combos of cloth nappies. 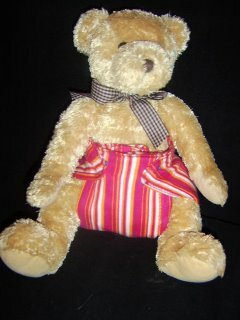 Darlings Downunder is another business site with some gorgeous nappies for sale. I think the rainbow colours on the Totbot fitted cloth nappies are divine and would make a great gift to someone using cloth. 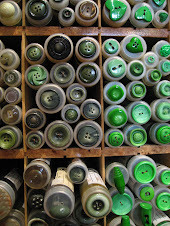 Nappycino has great discussion boards for any questions and lots of sewing info on all the different styles. I know this was kind of long-winded, but I'm very excited about cloth nappies! The general consensus amongst the public is that they're hard work and icky, when they're quite the opposite. The development of fabrics like microfibre and polar fleece means the babies skin stays 100% dry in cloth nappies and they so adaptable and cheap. I think it's sad that not a single woman that I work with uses cloth nappies, so I'll be making sure to take in all my sewing to show it off and inspire trying cloth instead of disposables. I don't have sewing machine, but could possibly use my parents or mother-in-law's and try making them. My cousin has just lent me 2 commercially made ones (with elasticised leg) to try out... deluxe!! She uses the "good" ones for when bub is out and about, and other cloth nappies for around the home, so I expect to have/make/buy a few types to try then settle down into a few different types of nappies that I prefer for whatever reason. Am going to try to go all cloth. What exactly is microfleece? is there something commonly made out of microfleece that you can give as an example? What is it made from?